File Server. 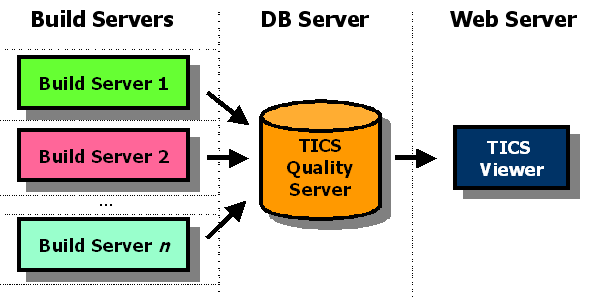 Apart from the three servers depicted in the figure below, there is a fourth server. This server contains all TICS executables and the central configuration. The reason why all TICS executables and the configuration are installed centrally is ease of upgrading, especially for large projects. Web Server. The results that are stored in the TICS database are shown via the TICS viewer. This viewer is installed on a Web Server. Build Servers. Build servers have access to the latest software archive and are capable of building the sources. Usually this is (a copy of) a machine that performs the nightly build. The build servers will invoke TICS to fill the TICS databases. Software archives can be distributed over several distinct build servers. It is possible to install the logical servers mentioned above on one or more physical machines. All logical servers can reside on a single machine or each logical server can run on its own separate machine. Mixed combinations are also possible, where multiple servers run on a single machine, and the remaining other servers each on a separate machine. For example, the file- and webserver may run on the same machine, while the database runs on a separate machine and the build server is yet another machine. The main motivation to decide how many physical machines are going to be used depends on the size of the organization/project. Organizations with less than 100 software engineers can typically do with one machine. It is possible to start installing everything on one machine and split up at a later stage. When installing TICS, run the specific steps and installers on the physical machine for which the software is to be installed. The different servers are linked together by configuring them. The examples given in this installation guide assume the simplest configuration, namely, where the File Server, Database Server, Web Server and Build Server are all located on the same machine. This is reflected in the destination folders suggested for the different components during the installation process.